39th Special BCS Seat Plan 2018. 39th Special BCS Preliminary MCQ Written Test will be held on 03 August 2018 at 3.00 P.M. to 5.00 P.M. 39 BCS Circular 2018 Special BCS Circular Published on 08.04.2018 & details click here. There is no doubt that 39 BCS is especially for the doctors. 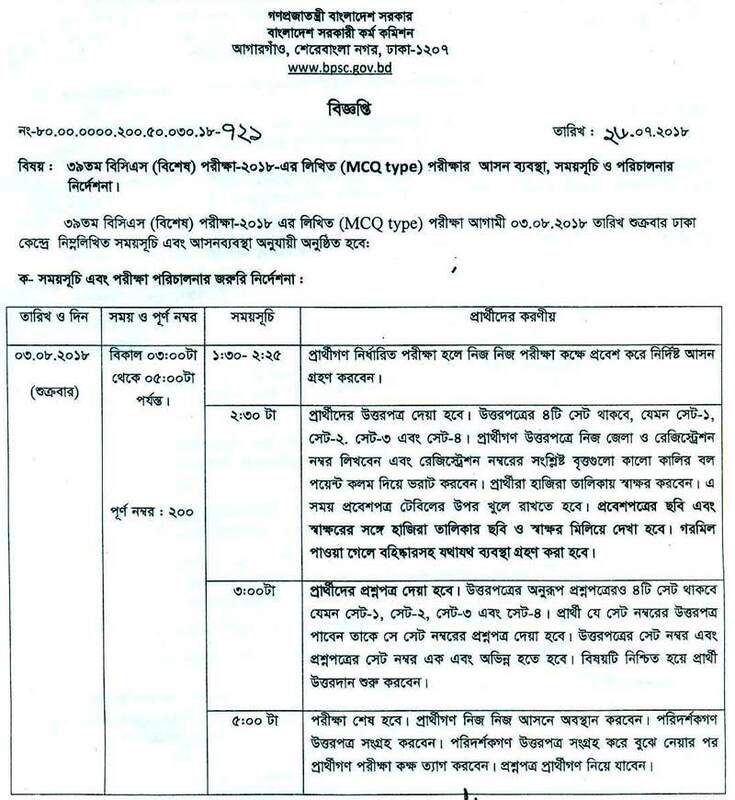 39th Special BCS Preliminary Gazette published (Updated on 24.03.2018) download. According to the source, a total of 4,542 assistant surgeons and 250 dental surgeons will be recruited through 39th special BCS. Preliminary circular of 39th special BCS published likely on this month. 39th Special BCS Online application date was fixed & published latter. 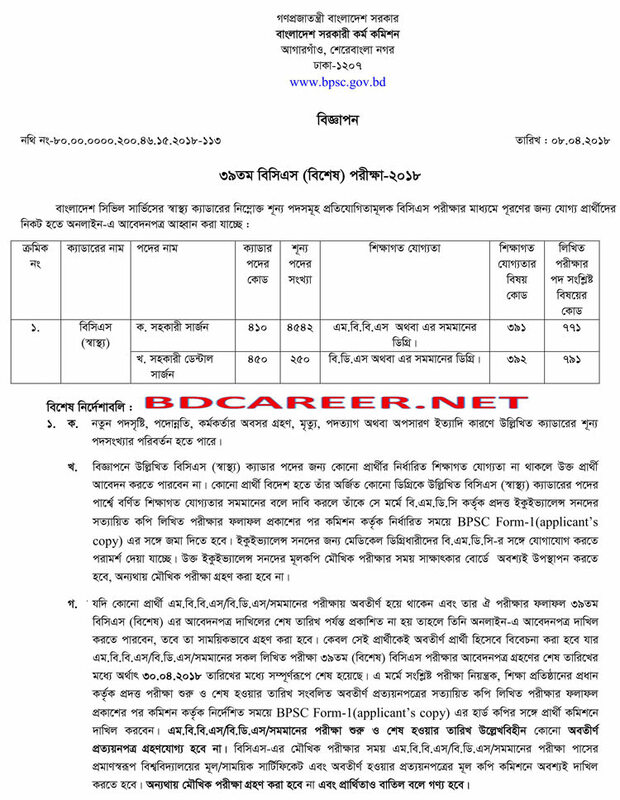 39th BCS Instructions for Submitting Application. BPSC will recruit Total 4,792 posts, of which 4,542 (Four thousand five hundred forty-two) for BCS (Health) Assistant Medical Surgeons and 250 (Two hundred fifty) posts for Assistant Dental Surgeons according to source and the demand of ministry of Health and department. Online application and submission starting at 10.04.2018 and End on 30.04.2018. BPSC will recruit Total 4,792 posts of assistant surgeons and dental surgeons under the ministry of health. Online application and submission starting date was notified after the circular that published befoe. 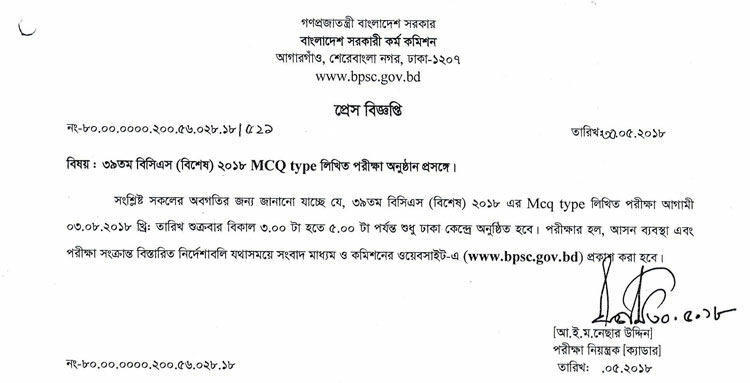 39h BCS Preliminary Exam starting date published here and in the Daily Newspapers and the website of the Commission (www.bpsc.gov.bd) and this site (bdcareer.net) in due time. The detailed direction of 39th Special BCS Preliminary Test Examination 2018 will be updated in due time. 39th Special BCS Preliminary MCQ Written Test will be held on 03 August 2018 at 3.00 P.M. to 5.00 P.M. 39 BCS Special Circular Published on 08.04.2018. 39th Special BCS Gazette published on 24.03.2018. 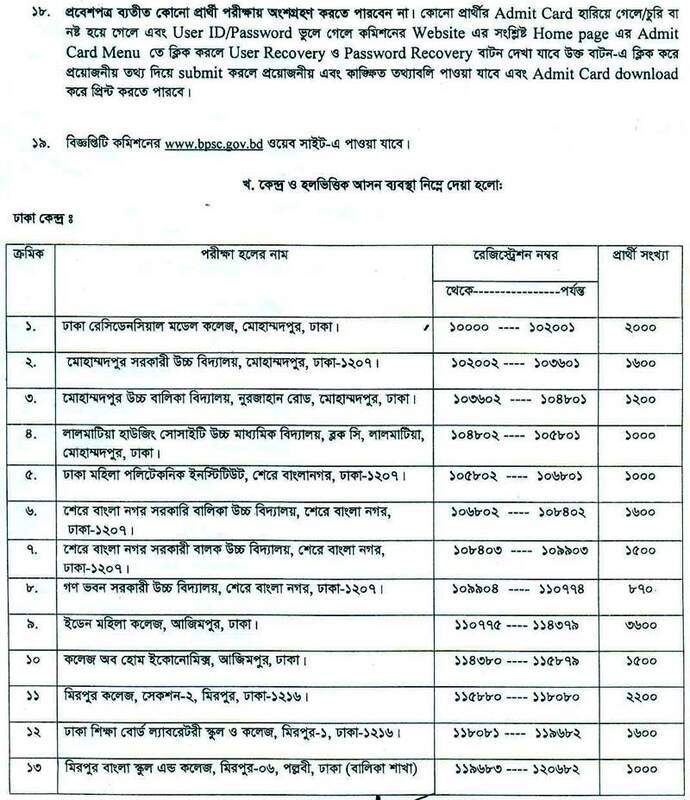 39th Special BCS preliminary circular of Bangladesh Civil Service (BCS) under Public Service Commission (PSC) will be published likely by this month, according to the source of BPSC. 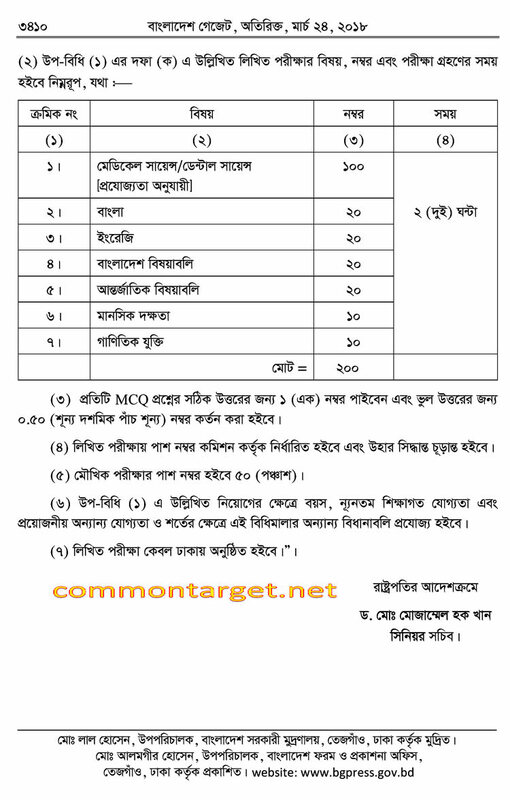 Public Service Commission (PSC) will recruit 4,792 posts. 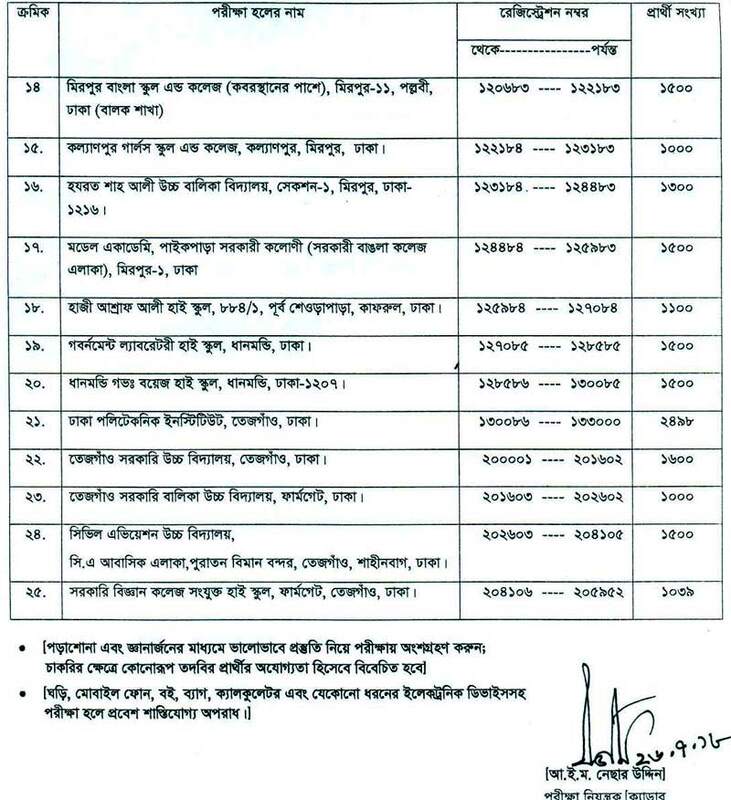 39th BCS Special Circular Gazette notification 2018. 39 Special BCS will be held simultaneously in Dhaka, Chittagong, Rajshahi, Barisal, Khulna, Sylhet, Rangpur and Mymenshing centers from 10:00 A.M to 12:00 A.M.
Online application and submission starting date 10.04.2018 at 10: A.M.
Online application and submission ending date 30.04.2018 at 06:00 P.M.
39th Special BCS Preliminary MCQ Written Test will be held on 03 August 2018 at 3.00 P.M. to 5.00 P.M.
39th Special BCS Preliminary MCQ Written Test will be held on 03 August 2018 at 3.00 P.M. to 5.00 P.M. through Dhaka, Chittagong, Rajshahi, Khulna, Barisal, Sylhet, Rangpur and Mymenshing exam centers. The two-hour long test will be held simultaneously in Dhaka, Chittagong, Rajshahi, Barisal, Khulna, Sylhet, Rangpur and Mymenshing centers from 03:00 P.M to 05:00 P.M.